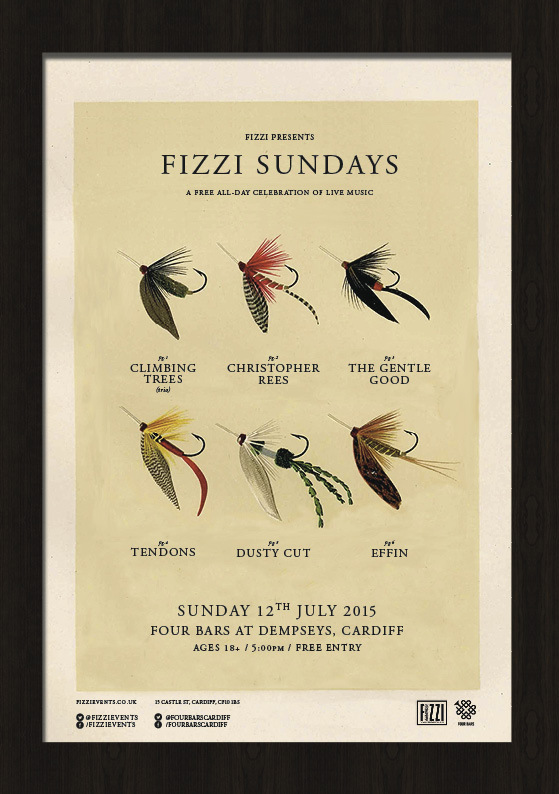 Fizzi Sundays is a monthly FREE ENTRY celebration of live music in Four Bars at Dempseys! 5pm doors – acts start early! Formed in the Summer of 2011, South Wales four-piece CLIMBING TREES soon came to the attention of BBC Radio Wales with their distinctive ‘Cymrucana’ sound, gaining ‘BBC Introducing Band of the Week’, ‘Artist of the Week’ and ‘Single of the Week’ recognition along with playlisting throughout the station in 2013 during the run-up to the release of critically-acclaimed debut album ‘Hebron’. The culmination of over two years of writing, gigging, recording and beard-growing, the album was recorded in isolation at Mwnci Studios in Carmarthenshire between May 2012 and February 2013, and celebrated with a special launch event at Cardiff’s Clwb Ifor Bach at the end of August 2013. Shortly after, the Trees were hand-picked by jazz supremo Jamie Cullum as support for the Cardiff leg of his ‘Momentum’ tour at a sold-out St. David’s Hall, and ended the year with appearances alongside fellow Welsh contemporaries Paper Aeroplanes and Al Lewis. Christopher Rees released the much touted ‘Kiss Me Kill Me’ EP via FFvinyl in 2001, receiving a Welsh Music Award nomination for ‘Best Male Solo Act’ two years running in 2002 and 2003, and made history by becoming the first act in over a decade to support former Velvet Underground legend John Cale during a 2001 UK tour. After embracing the spirit of empowered independence he establishing the Red Eye Music label with fellow musician Dave Stapleton in 2003 and released his debut album ‘The Sweetest Ache’ in October 2004. Building a seven piece band around him that included cello, violin, double bass, piano, guitars and drums, the album received widespread critical acclaim for its musical ambition and dramatic intensity. The Gentle Good is also known as Cardiff born Gareth Bonello, a Welsh folk singer and songwriter. His honest and tender vocals are well matched to an intricate guitar style that owes much to the great guitarists of the 60s folk revival. A dedicated multi-instrumentalist his recordings are layered with subtle string arrangements as well as banjos, mandolins and glockenspiels. Following a series of self released EPs, the debut album While you slept I went out walking was released by Gwymon records in November 2008. The album received praise in the critical press, with Gareth variously being compared to Nick Drake, Martin Carthy, Bert Jansch, John Renbourn, John Martyn and Donovan by the likes of Mojo and the Guardian. The mighty Bob Harris repeatedly lavished high praise on the album on his Saturday night show and radio stations throughout the UK have gradually begun to play The Gentle Good. A captivating live performer, The Gentle Good can enchant an audience with just a guitar, weaving dark stories amongst tragic folk songs as he performs. Recent developments have seen Gareth perform with a string section – delivering a more complete sound closer to those heard on his records. Tendons are a five-piece, five voice, harmony led indie folk band based in Cardiff, who bring tight harmonies and timeless, beautiful songs.